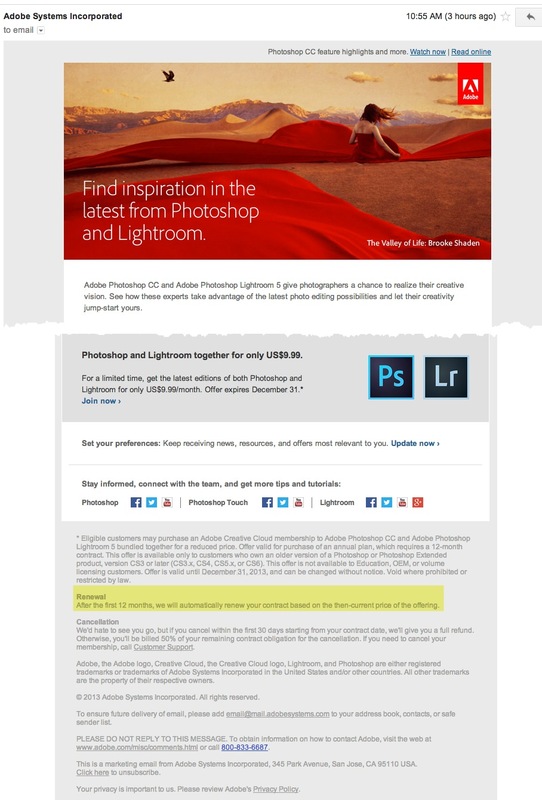 Adobe has posted their Terms & Conditions here regarding the Photoshop Photography Program. The screenshot of those terms are below. First note that this offer is valid until December 31, 2013, BUT it can also be changed without notice. If you think this is a good deal for you, you might want to sign up sooner rather than later. Ummmm – what about that $9.99 per month guarantee?? I have already addressed this issue a week ago, yet the questionable terms still exist. 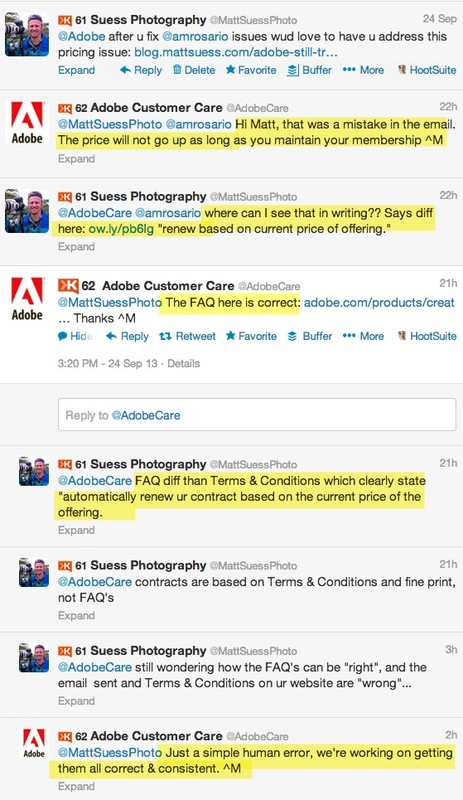 I had a conversation with @AdobeCare on twitter earlier this week about the terms. I requested to see it in writing where Adobe promises that the price will not increase because reading the terms it says it can. The only writing Adobe pointed me to was a FAQ that came out weeks before the bundle was available. Here is the conversation I had. According to ^M at @AdobeCare the two emails I received the other week that said, “After the first 12 months, we will automatically renew your contract based on the current price of the offering” were actually a mistake based on human error. Ok – great – it is a mistake and they are going to fix it, right? Well I just received another email from Adobe today and the terms have not been changed yet. The Terms & Conditions on their website still state the same today as well. I am not sure how long it takes Adobe to change some simple text on their website and emails – I know for me personally I could have it changed on my site in minutes. But until they do one should proceed with caution. Even though Adobe says the price won’t increase in a FAQ on their site, I am sure lawyers would refer to the fine print in the Terms & Conditions which as of now still sate different. So Adobe, can we get some clarity on this in writing in the fine print?? So there it is. They don’t have plans on increasing the monthly fee at this time but they are reserving that right to change the price in the future. I wouldn’t take much stock in believing the price will remain the same as long as you keep with your membership like many photographers are interpreting their statements and what Adobe was trying to let us believe here and here and here. I know many photographers believed this pricing would be in effect for life if they kept their membership. I really don’t think that will be the case. It always is important to read the fine print.